We hope that you enjoyed the Thanksgiving holiday and are doing well. Included in the December 2018 issue of the Hot SHEET newsletter you'll find Between the Sheets – a new advice column written by experts to help men and women get answers to questions about sexual health and intimacy challenges that can result from prostate cancer treatment. W e invite you to send us a confidential email with your questions for publication to ustooBTS@ustoo.org . 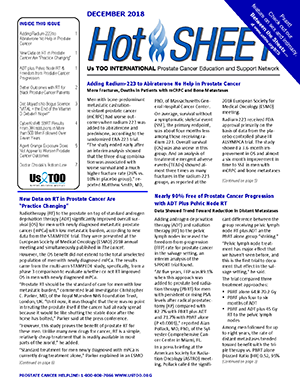 In addition to the following updates and information, news article titles of Prostate Cancer News You Can Use are listed below along with a link to the Us TOO web page that provides access to the full text for each article. You might have seen the Us TOO Holiday Hope fundraising campaign which launched this week. If you’ve already made a contribution, thank you so much! And if you’ve not yet done so, PLEASE DONATE to help support the work that we do at Us TOO providing educational resources, support services and personal connections to the prostate cancer community at no charge. Special thanks to Jim and Mo Kiefert for sharing their story and photo as featured on the Holiday Hope digital materials and printed holiday greeting cards. And thank you to everyone who's sent us quotes of Holiday Hope! We were pleased to present the Prostate Cancer Pathways for Patients and Caregivers event and webcast on November 3, at NorthShore University Health System in Skokie, IL. Medical experts presented a brief overview of men’s wellness and health risks, including prostate cancer, followed by educational content for managing prostate cancer that’s newly diagnosed, recurring, or advanced. The event featured special presentations on erectile dysfunction and incontinence after prostate cancer treatment. Video from the event will be posted within the next few weeks. We’d like to thank all Pathways event attendees and sponsors , including local support group leaders, the online webcast audience, NorthShore University Health System for hosting the event; presenters Dr. Jeffrey Albaugh, Dr. Brian T. Helfand, Dr. Benjamin H. Lowentritt, Dr. Heather L. Moky-Cordova; and event sponsors Janssen Oncology, Bayer, Sanofi Genzyme, Astellas/Pfizer, Amgen, Genomic Health, AbbVie, and Augmenix. CLICK HERE to access direct links to video segments specific to each topic. 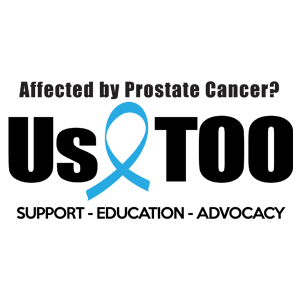 IRONMAN is a registry recruiting 5,000 men with advanced prostate cancer from nine countries. More than 366,000 men die of prostate cancer globally every year. Research on a man's type of prostate cancer, treatment and side effects will help inform what causes prostate cancer, how to stop or slow its progression, and how to provide the best possible care to enable men to live the best quality life possible. Learn more and participate at: www.IronmanRegistry.org . Facing cancer isn’t easy, but LivingWith™ may help. It’s a free app for people living with cancer and those who love them. Designed to help you connect with loved ones, ask for the support you need, remember important information from doctors’ visits and stay organized, all in one place. Visit www.ThisIsLivingWithCancer.com to learn more and download the LivingWith app for free on your smart phone. It’s available in English and Spanish. Cancer.com provides educational content on several types of cancer, including prostate cancer. Information covers diagnosis and multiple topics on prostate cancer at various stages of the disease. The Metastatic Prostate Cancer Project takes a new approach to cancer research in which researchers partner directly with men with metastatic and/or advanced prostate cancer, who share their samples and clinical information in order to speed up important discoveries. The project was launched in January of this year by Count Me In, a non-profit stewarded by the Broad Institute of MIT and Harvard, Biden Cancer Initiative, Emerson Collective, and the Dana-Farber Cancer Institute in an effort to accelerate the pace of discoveries for men with advanced prostate cancer. The project invites participation from men around the country with metastatic and/or advanced prostate cancer to study their cancer using cutting-edge genomic and molecular research studies performed at the Broad Institute. To date, over 580 men have joined the study. Learn more and join at: www.MPCproject.org . Please note that the content below lists only the title of the article rather than a direct link to the content. For access to the full content of each article CLICK HERE .